A fascinating and comprehensive look into one of chemistry's fastest growing specialties--sesquiterpene synthesis--Volume Ten of The Total Synthesis of Natural Products focuses on acyclic and monocyclic compounds and sheds light on the structure and makeup of this important class of hydrocarbons. The research on the synthesis of sesquiterpenes, derivatives of terpenes, a class of hydrocarbons commonly found in oils, resins, and balsams, has grown exponentially over the past fifteen years. With over 500 sesquiterpene syntheses already developed, the literature on this experimental specialty is voluminous, now encompassing over 1,600 re-search papers. Volume Ten in The Total Synthesis of Natural Products provides a systematic and comprehensive look at acyclic and monocyclic compounds in sesquiterpene synthesis. Reflecting one of the significant changes in sesquiterpene re-search, that is, the increase in compound targets prepared in an optically active form, the present volume includes their absolute configurations, signs of optical rotation, or both. This newest volume in The Total Synthesis of Natural Products series is an "A-to-Z" look at acyclic and monocyclic compounds in sesquiterpene synthesis, one of the most dynamic areas in the ongoing revolution in chemical synthesis, and is a must for the chemical professional. DAVID GOLDSMITH is Professor of Chemistry at Emory University in Atlanta, Georgia. Professor Goldsmith is former Chair of the Emory Chemistry Department and has been Visiting Professor at Strasbourg, Mulhouse, and Grenoble. 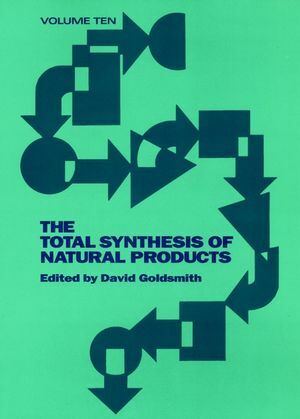 Professor Goldsmith received his PhD in organic chemistry from Columbia University, and his research interests have been principally in the field of natural product synthesis.